Assange back in spotlight with new book Jump to media player Julian Assange has now been staying at the Ecuadorean Embassy for three years, sheltering under its flag for fear of ultimate deportation to America, after his organisation Wikileaks revealed thousands of US government cables. 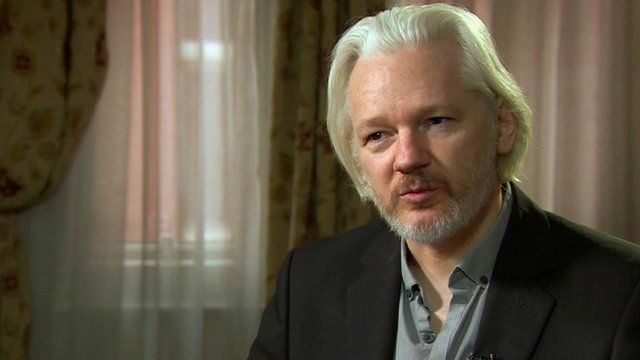 Julian Assange has now been staying at the Ecuadorean Embassy for three years, sheltering under its flag for fear of ultimate deportation to America, after his organisation Wikileaks revealed thousands of US government cables. One of the ways he has been spending his time is commissioning The Wikileaks Files, a series of essays from around the world on the impact of Wikileaks on various countries. On that subject alone he agreed to speak to Newsnight's Nick Hopkins, and defended the range of authors, saying it was "a serious book".